This time next week I'll be in New York City at the rawther fabulous Mandarin Oriental for an introduction to the Ninja Master Prep, a revolutionary kitchen appliance from global lifestyle brand Euro-Pro (the makers of the popular Shark line of vacuum and steam cleaners). 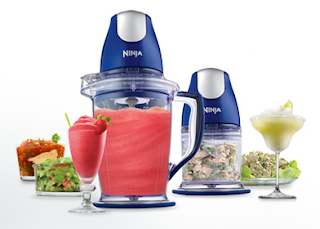 Food Network Chef Robin Miller will be demonstrating the many uses of the Ninja Master Prep to a group of bloggers from all across the country, including quite a few of my bloggy friends. Yay! We will also get to see demonstrations of other Euro-Pro items. (I am particularly interested in learning more about their steam cleaners because our master bath has uneven-surfaced natural slate tiles that are very pretty but a total nightmare to clean. I'm hoping they have something perfect for that, since apparently no one else does…) This will be my first big blog-related trip and I am so excited that it involves food and cooking. An extra bonus to this trip is that I will be able to see my relatives (grandpa, aunt and cousins!) in New Jersey. I am sure I will have plenty to tell you about next week, stay tuned. You can also follow our Ninja Master trip by using #NinjaLaunchNYC on Twitter. I'm so happy for you! NYC! I know you must love the city! So different than the star you live on. How fun! And I'm jealous that you get to stay at the Mandarin--fancy digs! Can't wait to hear all about your trip. Ah! How did I miss that you're going to NYC!? That is so totally awesome, Naomi! I hope you have the best time - can't wait to hear all about it. Missing you! My Alabama blogger friend Rachael is one of your group. Be sure to say howdy. I will be there as well and can't wait to meet you. Hey - I will get to meet you there!